The Provence Rooibos is a top grade herbal tea from South Africa. 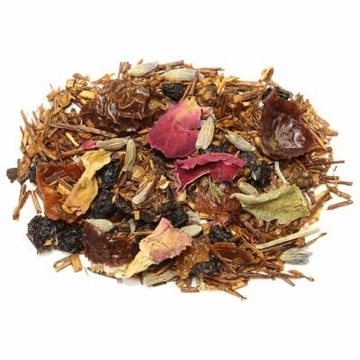 This delicious tea includes Rooibos, rosehip shells, dried black currants, rose leaves, lavender, dried red currants, rose petals, and dried blueberries. Rooibos, meaning Red Bush in Afrikaans, is grown at the altitude of 2000 feet above sea level in the Cedarberg region. Fermentation of the Rooibos turns the leaves from green to deep red and gives a slight sweet note. When brewed this tea produces a reddish orange liquid with a sweet fruity taste and a floral aroma. Research has shown Rooibos tea to be a rich natural source of antioxidants with a high level of flavonoids. The absence of caffeine makes it an ideal drink, even at night. 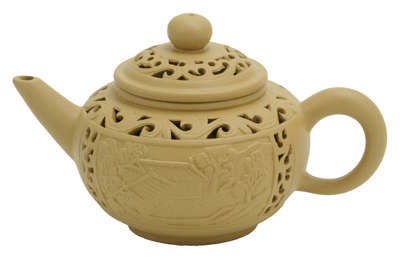 A soothing, mellow cup of tea. I like to drink this before bed to help me wind down. Bursting with floral flavors. A truly delicious rooibos, flavored tea. All blends perfectly for an enjoyable cup of tea. I make it with honey for my kids. This is too sweet for me, even without additional sugar/honey..
As well as tasting great, this tea looks so pretty in a glass teapot. Wonderful drink. I like before bedtime. I will keep in stock mild tea very nice. This is a great blend for winter evening. I used to buy this blend from David's tea but the price was a little steep. I was excited to have found the same blend with a better price, the ingredients matched. The tea is fine, the smell and taste is a little stronger than the David's tea blend, thus the 4 star instead of 5 but for the price it is great. This is my absolute favorite tea. It is richly flavored and with just a touch of sweetness. I can steep this tea in an insulated thermos pretty much all day long and it never gets bitter or overly strong. Provence is a delightful tea that makes you stop and enjoy the tea. Lightly refreshing in taste and scent. I have converted non tea drinking friends to the tea world with this tea. They've never tried anything like it, and are hooked when they find out the many health benefits included in the rooibos family of tea. 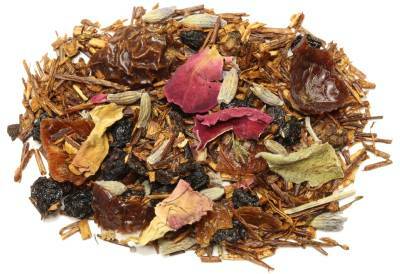 Fresh, enjoyable herbal tea blend. This is one of my favorite rooibos. It's so smooth. Enjoy it without adding milk, sugar, etc. I love serving it to children and expectant moms. After drinking a cup, prepare to let go and relax! Had never tried Rooibos tea before. Very different and fragrant and tasty for something different. 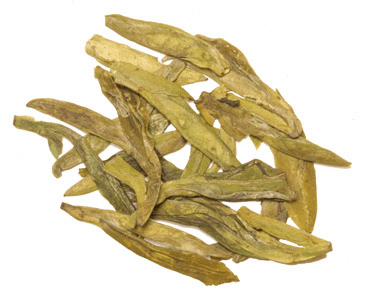 this tea can be mixed with any herbal tea or combination of herbal teas. it can give life to a bland, dull tasting herbal. and i tried it with indian, chinese and south american teas; from jiao gu lan to tulsi to yerba mate to siberian gensing. it blends well and is truly a universal donor. Since my first taste of this tea, I loved it! A wonderful flavor of a special blend. Its delicious! This tea was a total surprise and delight. The flavor is unique, with a touch of floral or fruit, but not at all overpowering. I like to drink it after dinner, as it seems to fill in for dessert. Very satisfying. My husband loves this blend- it's sweet and fruity and a little floral. Some of the fruit blends can be too tart or sharp for him- but not this, it has a pleasant smoothness. This rooibos is a favorite with him and it's been a regular in our house for years. A great tea for late afternoon and evening. I often drink this before bed. It smells divine. My favorite tea comes very quickly every time I order! Bought this for my husband after tasting Capetown Rooibos while on vacation in Costa Rica. This tea is so refreshing and full of flavour that now he has me hooked on it. Love it! Very flavory with touch of lavender, and rich in color. Sooo good! The best tea ! I used to be able to get Provence tea locally, which is my favorite. But the company that sold it locally is not here any more. So I was lucky to find this tea here at Enjoying Tea. I was so happy to enjoy it again after over a year of being without. The flavor of this tea is fragrant and so relaxing. A cup will always put me in a good mood. Love it! mixed this with your rosehips tea, it was great. I love the combination in this tea. It is so refreshing. our favorite one for a long time. We add a little more punch by adding a very small butch of decaf peach/apricot (or if out of stock an extra rooibos). very pleasing, with a natural sweet-note that's soft on the palate. I truly enjoy this tea. My one complaint is that the finer herbs still find their way through most of my straining gadgets. I absolutely cannot use it with the Filtering Tea Mug or Smart Tea Maker due to the smaller particles filtering through. But the Snap Close Pincer Spoon Infuser works well........so all is not lost. This tea is one of my favorite teas! I bought it last year at a local tea shop and fell in love with it. I only bought a half of a pound(should have bought more because a half didn't even last a month) and have not been able to go back to the shop since. I was incredibly happy that I found Provence on this website for half the price! I will definitely be keeping this in stock now! Admittedly: red tea isn't really my thing. However I still drink it because it is caffeine free, and of all the ones we have tried, like this one best. The added flavors are so lovely. The currants come through the strongest. I imagine that if you loved rooibos, you'd really love this tea. Whenever I offer tea to guests, this is always the one they choose, and they always say how much they like it. Excellent flavor and no caffeine so I can drink any time of the day. Excellent tea with a delicate, but full flavor. It has a slightly exotic flavor and tastes good with almost anything, including by itself. Both myself and my husband love it and drink approx. a pot a day. This particular rooibos is the perfect combination of fruit and floral and the after taste is wonderful. I highly recommend it. And because it has no caffeine I think it's very appropriate for children. It's a good "beginner" tea. This delicious tea was introduced to me by my sister. The aroma, taste and health qualities made this a winner. I have GERD (acid reflux disease) and drink no caffeine. I don't like carbonated drinks and most juices are too acidic. That left water and red tea or herbal tea. Rooibos has been my favorite for iced tea. This combination is a real find for me. If only you offered it in teabags! Our neighbor introduced us to this wonderful blend of tea. The incredible aroma will fill your home and you may find yourself brewing a pot just for the way it smells. Your nose will linger a while on every sip just to take it in. Excellent hot or cold, it has a slight sweetness that accentuates it's flavor. It's not overly fruity or spicy and will satisfy even the most demanding palate. If you love tea the way we do, we are convinced that this will become your new favorite tea, just as it has become ours.